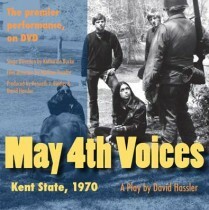 On October 12, 2012, the play, May 4th Voices, was featured at the annual Oral History Association Conference in Cleveland, Ohio. 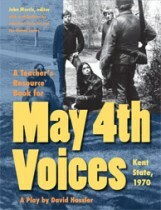 Over the next month, film director Mathias Peralta and stage director Katherine Burke worked with the cast to create a film version of the production to accompany A Teacher’s Resource Book for May 4th Voices. The film received its debut at the Modern Language Association annual meeting in Boston on January 5, 2013 and will receive its broadcast debut on Western Reserve Public Media on PBS channels 45 and 49 and made available for national distribution in late spring 2013. Bodies and Barriers offers a collection of dramatic pieces of our time that provide an aesthetic perspective from which we view today’s vital health issues. With each play exploring a different medical crisis, the collection covers a range of issues common to a diverse population, irrespective of gender or race. Included are works examining how individuals confront the challenges posed by physical disability, aging, and terminal illness. These plays take as their subject the human form and its pathologies while providing a humanistic perspective from which to view men and women as they come to terms with a loss of physical and emotional well-being.